Slope is a sleek universal tablet holder or smartphone stand that complements your devices and also your space. The brushed aluminum design is sturdy and has two nanofoam pads that use micro-suction technology—thousands of microscopic suction cups create a vacuum seal when pressed—to securely grip your device and the surface you place it on. Dimensions: Small: 3.25" x 3.5" x 5.5"; Large: 3.50" x 4" x 7.50"
Weight: Small: 0.35 lb. ; Large: 0.68 lb. 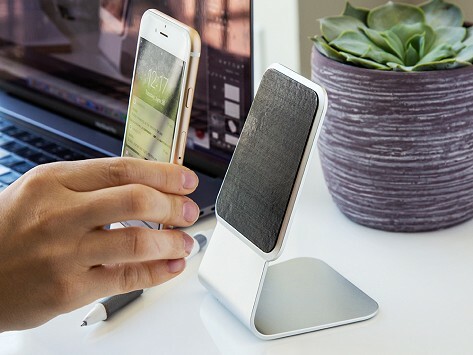 I purchased this Slope cell phone holder for use in my office and I need to know where my cellphone is in the clutter on my desk. This holderholder allows me to charge my cellphones and keep it in a easily accessible spot. Slope’s universal tablet holder and phone stand combine a sleek, industrial-inspired finish with the surprisingly sturdy grip of micro-suction to make for a prop-it, hold-it tool you’ll feel good about having in your space. The brushed and anodized aluminum stand can hold just about any tablet or smartphone that has a flat metal back or a flat case on it. We were impressed with how solidly built Slope is and just how strong its grip is. A nanofoam rubber pad gets its stickiness from micro-suction technology. The surface of the pad is covered with thousands of microscopic suction cups that create a vacuum seal when you press your device against against them. There’s a pad at the base of the stand, too, to provide that same sturdy grip on counter tops, desks, or wherever you want to firmly stick your tablet or phone.